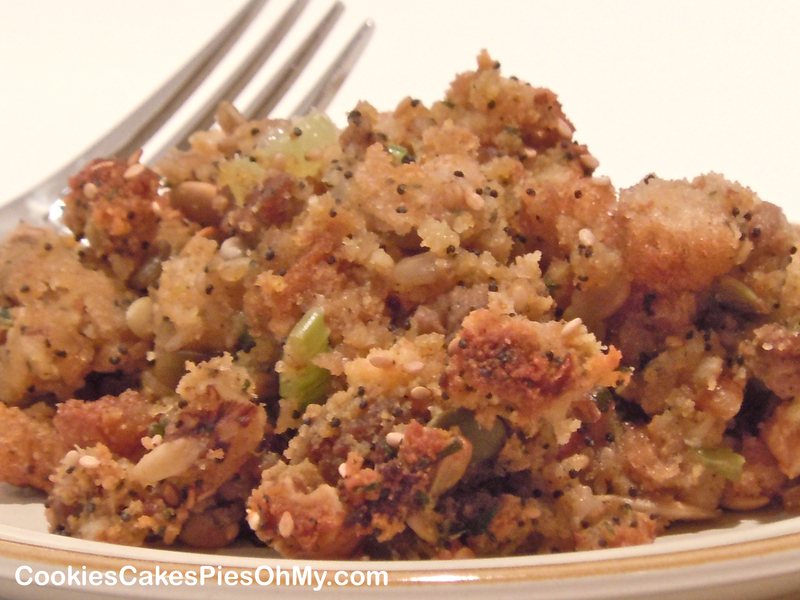 This is my favorite stuffing, Sausage Seed Cornbread Stuffing. This is a big problem for me, every time I make this stuffing I have a control problem. I try to limit myself but I know it’s there, haunting me from the refrigerator…warm me up, don’t you want some more? Yes, but I have already had you for breakfast, lunch, dinner and numerous snacks. Stuffing is my favorite dish at Thanksgiving followed closely by sweet potatoes, mashed potatoes, rolls and everything else! Preheat oven to 350°. Melt butter in fry pan and saute onion and celery until soft. In large bowl combine cornbread, seasoned bread stuffing, poppy seeds, sesame seeds, sunflower seeds, pumpkins seeds and walnuts. Stir all together and then stir in browned sausage and celery/onion mixture. Sprinkle with sage, poultry seasoning, and parsley, mix in. Begin pouring chicken broth over stuffing, it will take at least 2 cups, then pour enough until starts to hold together as you turn in over with a spoon. You want it to hold together but not turn to mush. Sprinkle with season salt, gently stir in, and taste. Repeat until desired taste. Spoon into a 13×9 pan (I use a 15×10 to have more crisp surface area). Bake for 40-55 minutes depending on your desired browning, check frequently. Optional-add waterchestnuts, mushrooms, craisins…make it your favorite. Preheat oven to 375°. Spray pan. In microwave safe bowl, melt butter. Stir in sugar. Add eggs and beat until well blended. Combine buttermilk with baking soda and stir into mixture. Stir in cornmeal, flour, and salt until well blended. Pour batter into prepared pan. Bake for 30 to 40 minutes (18-25 for 13×9) or until a toothpick inserted comes out clean. For stuffing, cool in pan for 10 minutes then turn out on wire rack and cool. Cut into cubes. My family and others request this bread. Loaded with five different seeds and cracked wheat. I find most of these seeds in the bulk isle of most grocery stores. Put cracked wheat in a bowl and pour boiling water over, let soak about 15 minutes. In mixer (Kitchenaid or similar with bread hook), pour warm water, sprinkle sugar then yeast. When yeast is foamy, stir in wheat flour, eggs, salt, and oil. 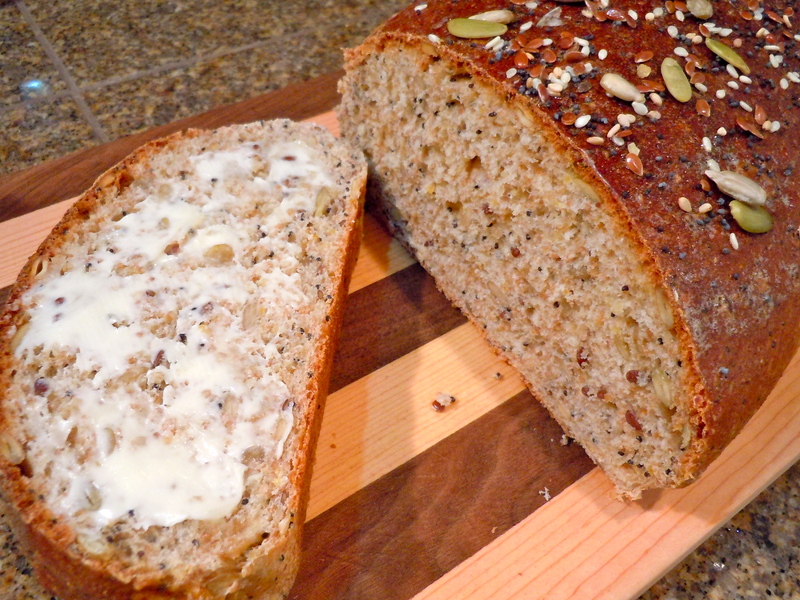 Combine all the seeds in a large bowl and set aside 1/4 cup to sprinkle over top of loaves. In the large bowl with seeds, stir in presoaked cracked wheat and 1 cup of white flour. Stir this seed mixture into yeast mixture in the mixer. Mix in remaining 2½ cups white flour and knead. Turn dough into oiled bowl, cover and let rise for 1 hour. Divide dough in half and shape into 2 long loaves and place side by side on baking sheet. Allow to rise about 30 minutes. Preheat oven to 375°. Bake loaves until almost done about 30 minutes. 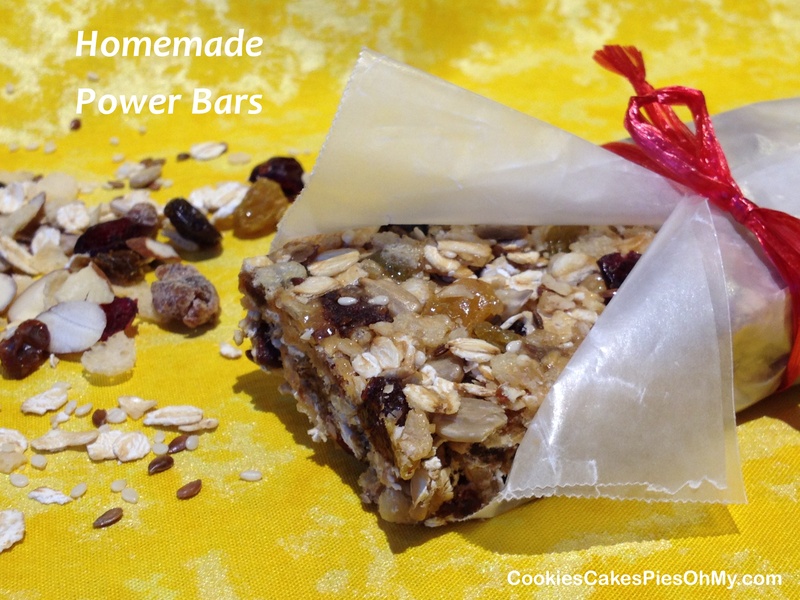 Brush with water or egg white and sprinkle with reserved seeds, continue baking about 5-10 minutes longer. When the loaves are done, they will make a hollow sound when tapped. Cool on rack before slicing. 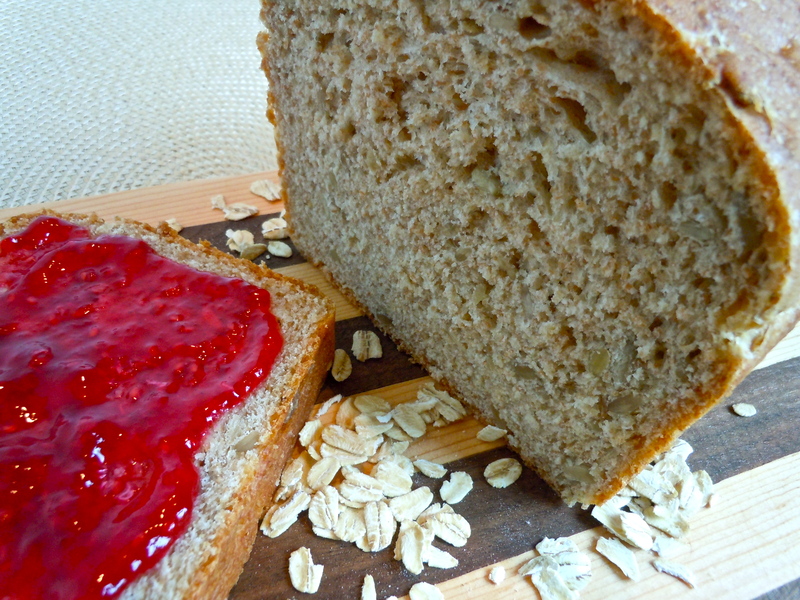 This is a hearty bread with good texture but not too heavy on the whole wheat. The true test with wheat bread seems to be if I can get my son to eat it, this one works. In saucepan combine oats and milk. Cook over medium heat until oats are soft about 5 minutes. Remove from heat. 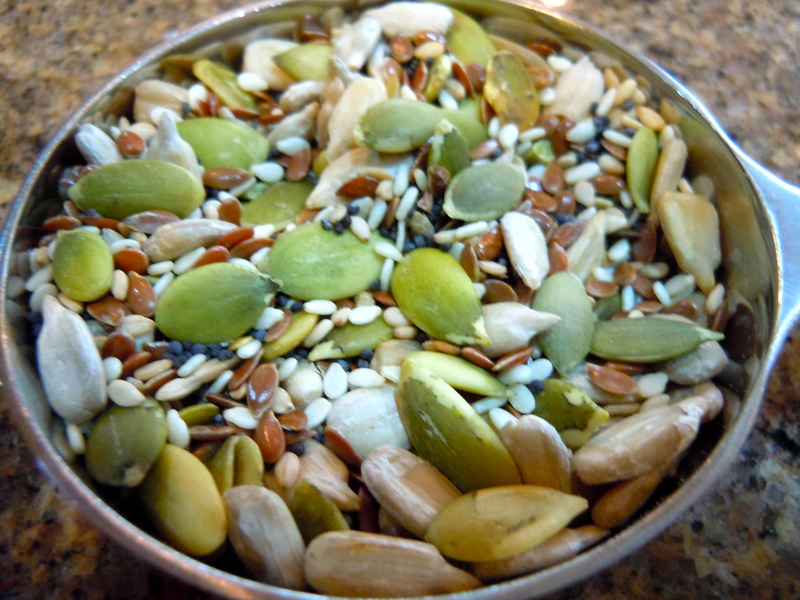 Stir in sunflower seeds and oil; cool to lukewarm. In large bowl, dissolve yeast in the 1/2 cup warm water with 1 Tbl sugar. Pour oatmeal mixture into yeast. Add the 1/2 cup white flour, salt, and sugar, blend. Mix in remaining wheat flour and white flour to make a stiff dough. Knead. Turn into greased bowl, let rise about 1 hour. Punch down and make into one loaf. Put in greased bread pan, let rise 45 minutes. Bake in 350° oven for 38-45 minutes.